Learn more about After Sunday, it's mission and hopes for the future. Read more about the thinking that lies behind After Sunday which informs what we do and what we offer. Working together with After Sunday? After Sunday is keen to work together with others who share our enthusiasm for connecting faith, daily work and life. Explore ways we might work together. Read about After Sunday's vision, our aims and purposes and find out about the Trustees and Team who run After Sunday. 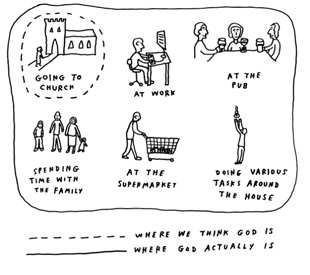 After Sunday has links to a wide range of websites, books, articles and other resources to help you explore more about After Sunday thinking, faith at work, vocation and reflection. What's the need for After Sunday? We are interested to hear your views about how you see the need for After Sunday, to help us to focus our priorities and gain support for the work. Please complete this brief questionnaire and encourage others to do the same. What do the different Christian denominations think about faith and work issues and what ideas and initiatives do they have to encourage us?